Though recently alighted in the fiercely competitive mobile handset market, Aroma Mobiles seems to have hit the right chord for style-conscious and pocket-hugging users. Well, the company has just come up with its latest dual SIM handset, the D110. Designed to be affordable, the eye-pleasing device promises to keep socially switched on users completely connected with their loved ones. For photography admirers, a decent 1.3 megapixel camera has been cohered to the handset. With this one around, users will now never be away from their amigos with its GPRS/WAP 2.0 and MMS facility. The trendily crafted D110 also comes preloaded with Facebook and MSN Messenger. The handset’s 2.4-inch 262K color QVGA display truly enhances the user experience, ensuring to render image quality with utmost clarity and brightness. "India has been one of the fastest-growing markets in the mobile handset industry over the past few years. We, at Aroma, are constantly striving to provide the young, tech savvy individual with a cost effective yet tech superior handset. Priced at Rs 2,699, D110 has all that a person can want in a mobile and lot more," stated awan Chadha (Director- Sales, Marketing & Service), Aroma Mobiles and Accessories Pvt Ltd. The dual SIM Aroma D110 also equips attributes like multi-format music player, stereo FM radio with recording, 3.5mm audio jack, video playback and recording, and support for Hindi language. In addition to Bluetooth connectivity, the handset serves users with a powerful Li-ion 1500 mAh battey that offers talktime of 500 minutes and standby time of 500 hours. Users can now easily stockpile their favorite pictures with the device’s expandable memory that supports up to 2GB. Further, utilities like flashlight, alarm, world clock, stopwatch, calculator, currency converter, unit converter, audio equalizer, slide show, e-Book reader, and notes are also included. 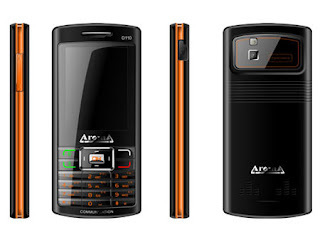 The new Aroma D110 phone can be purchased for as low as Rs. 2,699.